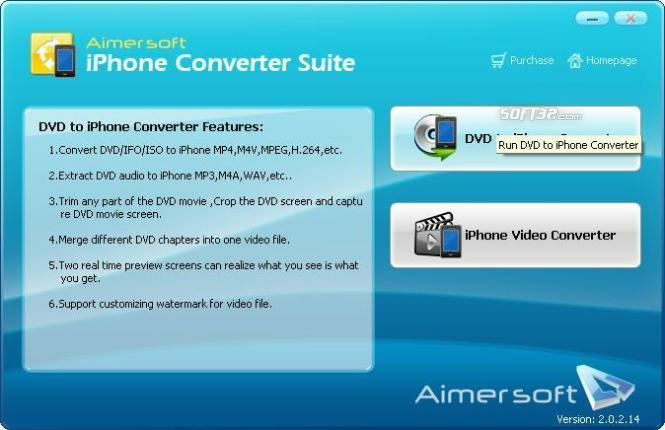 Aimersoft iPhone Converter Suite includes DVD to iPhone Converter and iPhone video converter that helps you rip DVD to iPhone & convert video to iPhone(3G). It is the most powerful iPhone converter. Aimersoft iPhone Converter Suite is an all-in-one and easy-to-use iPhone converter bundled by two excellent iPhone converters: DVD to iPhone Converter and iPhone Video Converter. This iPhone Converter Suite can rip DVD to iPhone and convert almost all video formats to iPhone MP4 Video with excellent quality and super fast conversion speed. With the adoption of powerful iPhone Converter, you can rip DVD to iPhone and convert various video formats including AVI, XviD, WMV, MPEG, MPG, FLV (Youtube), DAT, RM, RMVB, MOV, ASF and limewire video to iPhone MP4, and even to Apple iPod Video and Apple TV! This iPhone Converter Suite automatically rip DVD movie to iPhone MP4 MPEG-4 H.264 Video.Convert various video formats including AVI, XviD, WMV (Windows Media Player Video), MPEG, MPG, FLV (Youtube), DAT (VCD), RM, RMVB (RealPlayer), MOV (QuickTime), ASF and limewire video to iPhone MP4 MPEG-4 H.264 Video. Easily rip audio from DVD and video to MP3, WAV, AAC as your iPhone tones. Support iPhone, iPod Video and Apple TV. This iPhone Converter supports batch conversion and customizing video profile, you need not click time and time again for setting as once you save your individual setting as profile, it makes your conversion much easier. Built in MP4 and H.264 encoder provides you with very high video quality; All encoders/decoders are built in. An excellent iPhone Converter with great output quality. 4. Powerful editing function, High level customization. This iPhone Converter Suite support video trimming and video cropping. Set the start and the end to capture your favorite movie clips. Cut off the black edges of your movies and enjoy them on iPhone with full screen; Let you convert your DVD iPhone with the resolution, frame rate, video bit rate and sample rate you prefer. Fully support PAL and NTSC TV standards.